Sheet Metal International Association Issued a Charter to Local 504 on the 12th of June, 1957. Local 433 sault Ste-Marie was amalgamated with Local 504 September 5th , 1962. 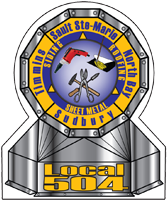 Local 504 area consists from (East) Mattawa to (West) Sault Ste-Marie. (North) Kapuskasing to (South) north of Parry Sound.